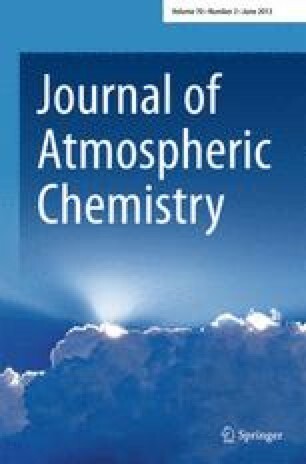 In situ AGAGE GC-MS measurements of methyl bromide (CH3Br) and methyl chloride (CH3Cl) at Mace Head, Ireland and Cape Grim, Tasmania (1998–2001) reveal a complex pattern of sources. At Mace Head both gases have well-defined seasonal cycles with similar average annual decreases of 3.0% yr−1 (CH3Br) and 2.6% yr−1 (CH3Cl), and mean northern hemisphere baseline mole fractions of 10.37 ± 0.05 ppt and 535.7 ± 2.2 ppt, respectively. We have used a Lagrangian dispersion model and local meteorological data to segregate the Mace Head observations into different source regions, and interpret the results in terms of the known sources and sinks of these two key halocarbons. At Cape Grim CH3Br and CH3Cl also show annual decreases in their baseline mixing ratios of 2.5% yr−1 and 1.5% yr−1, respectively. Mean baseline mole fractions were 7.94 ± 0.03 ppt (CH3Br) and 541.3 ± 1.1 ppt (CH3Cl). Although CH3Cl has astrong seasonal cycle there is no well-defined seasonal cycle in the Cape Grim CH3Br record. The fact that both gases are steadily decreasing in the atmosphere at both locations implies that a change has occurred which is affecting a common, major source of both gases (possibly biomass burning) and/or their major sink process (destruction by hydroxyl radical). 1.School of ChemistryUniversity of BristolBristolU.K. 4.School of Earth and Atmospheric SciencesGeorgia Institute of TechnologyAtlantaU.S.A. 5.Scripps Institution of OceanographyUniversity of California at San DiegoLa JollaU.S.A.